Without fail, there was going to come a time when King Gizzard's reign of album releases finally caught up with them. 2017 has now seen the release of four albums, one off from their lofty predication this time last year. Regardless of the existence, or failure, of the fifth LP, it's say to call their ambitious tour-de-force a success. Previous to Polygondwanaland, King Gizzard released three albums that, to me, all directly opposed each other whilst combining, like a transformer, into the wildly formidable perception of King Gizzard that stands before us today. Flying Microtonal Banana took to the Australian outback, Murder Of The Universe did so in an alternate reality a la Mad Max, and Sketches Of Brunswick East rekindled the lost romance of the group and their suburban home. It's safe to call the music of Polygondwanaland another welcomed step in their ascension. However, it's also safe to call it their least conceptually-daring project yet. There's no gimmick, no hook, no new slant. For many, that's a good thing. The prospect of a bonafide King Gizzard album for the sake of having a King Gizzard album was dwindling in the past few years. Polygondwanaland rekindles that, but loses their aspired imagination along the way. Comparisons will, and have, been drawn to Nonagon Infinity. Sans that album's own gimmick of course, in that tracks endlessly flow into one another. If anything, the gimmick of Polygondwanaland, ironically, is that there is none, something of a rarity for King Gizzard lately. The album takes a decisively straight-forward approach to Psychedelic and Progressive Rock, finding Stu Mackenzie utilizing his self-reliant, mystified vocals over, under, and through the band's prototypical pace, tone, and atmosphere. That means there's little shape and identity to the songs, some exceptions including the 10-minute consummate of 'Crumbling Castle,' the meandering tribalism of 'Searching...,' and the final turbulent minute of 'The Fourth Color.' 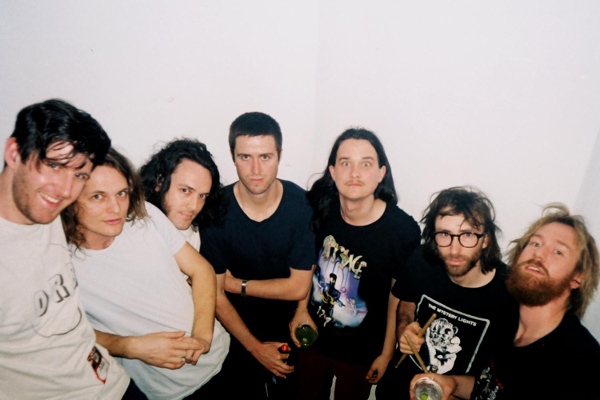 The rest, for better or worse, can be chalked up to stereotypical King Gizzard mannerisms. The most pressing of which is Mackenzie's insistence on remaining glued to the beat for his melodic bounce, something he rarely deviates from. In actuality, this is his worst example of this dependency yet, and once it's heard it's hard to ignore. Enjoyable tracks like 'Inner Cell' or 'Loyalty' are lessened, moderately, when you realize just how limited Mackenzie's reach is. As far as the content of Polygondwanaland, one can deduce the nature of the album by the hidden markers laid all across the cover. For starters, the title itself is a reference to Gondwanaland, a former supercontinent that existed 200 million years ago. Combining that with the outlandish tribal symbols, shrouded creatures, and pounding jungle percussion, and it's safe to see Polygondwanaland as a King Gizzard-approved revision of the mighty, mighty past. If it sounds familiar, that's because Murder Of The Universe already conquered this millennia-spanning story mere months ago. Polygondwanaland does make changes in the minutia though, pinning its focus on the details. 'Deserted Dunes Welcome Weary Feet' interpolates the daily life of a dinosaur, while 'Inner Cell' describes, grotesquely, a strange creature with mysterious power. Basically, there's no overarching story spelled out by spoken word this time around, although Leah Senior does reappear at the start of 'The Castle In The Air.' As a whole, Polygondwanaland is a fun listen. It's nothing more than that, which is something none of its 2017 brethren can attest to. Oddly enough, considering the zombified uprising of ancient beings, I'm reminded, both conceptually and musically, of David Bowie's Diamond Dogs. Problem being, while that was an electrified outcast of Bowie's career, King Gizzard's 12th merely fits neatly into place.